Published: July 27, 2007 at 11:12 A.M.
WASHINGTON, July 26 (UPI) -- Many U.S. Gulf War veterans continue to suffer from mysterious illnesses more than 16 years after the conflict ended, several witnesses testified this week before a congressional committee. "One in four of those who served -- 175,000 veterans -- remains seriously ill," James Binns, chairman of the Research Advisory Committee on Gulf War Veterans' Illnesses, said at a House of Representatives Health subcommittee hearing. "There remains no effective treatment," Binns said. In the absence of any cure, many doctors resort to treating each individual symptom with different medications, such as sleeping pills and diarrhea medication, said Meryl Nass from Mount Desert Island Hospital in Bar Harbor, Maine, who has conducted a specialty clinic to treat patients with Gulf War syndrome for eight years. "It's a piecemeal approach," Nass said at the hearing. "You can improve their functioning maybe 30 or 40 percent, but they certainly don't get cured." One of the difficulties in treating the illness lies in general confusion over the exact causes of the illness and a lack of effective research on treatments, witnesses said. 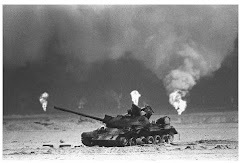 Although research has not proven definitive causes, the high level of toxins military personnel were exposed to probably caused most of the damage, said Lea Steele, scientific director of the Research Advisory Committee on Gulf War Veterans' Illnesses. "The most consistent and extensive amount of available evidence implicates a group of chemicals to which veterans were exposed that can have toxic effects on the brain," Steele said. "These chemicals include pills -- NAPP pills or pyridostigmine -- given to protect troops from the effects of nerve agents, excessive use of pesticides and low levels of nerve gas." 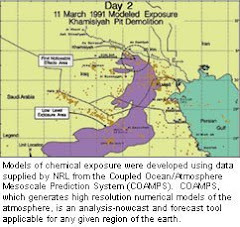 Other toxins include smoke from more than 600 burning Kuwaiti oil wells, military vaccines and low-level doses of chemical weapons, Steele said. While the symptoms of Gulf War syndrome overlap with those of many other illnesses, they manifest themselves much more heavily in Gulf War veterans than those from other eras, suggesting something specific in the Gulf War triggered this new syndrome, Steele said. "It's not what we see in the general population and it's not what we see in any other veterans group this age," she said. This hodgepodge of health problems seen in Gulf War veterans is not simply a manifestation of psychological problems either, Steele said. "Comprehensive studies have found no connection between Gulf War illness and combat experiences in the war," she said. "This stands to reason since, in contrast to current deployments, severe stress and trauma were relatively uncommon in the 1991 Gulf War." The war itself lasted for less than six months, with only four days of ground combat. The $260 million spent on Gulf War illness research by the Department of Defense and the Department of Veterans Affairs has resulted in few breakthroughs, Nass said. One reason for this lies in an a focus on psychiatric causes, instead of toxins or vaccines and research that did look at these factors often had faulty methodology, leading to useless results, she said. "Failed research does not happen by itself," Nass said. In many studies, the wrong questions were asked, dubious research methods were used or sample sizes were too small to yield statistically significant data. Much of this research resulted from an effort to discount veterans' claims that their sickness resulted from their military service, said Anthony Hardie, legislative chair and national treasurer for Veterans of Modern Warfare, a veterans advocacy organization. "Years were squandered disputing whether Gulf War veterans were really ill, studying stress (and) reporting that what was wrong with Gulf War veterans was the same as after every war," Hardie said. "An incredible amount of effort was put into disproving the claims of countless veterans testifying before Congress about chemical and other exposures." However, Veterans Affairs officials said the department has continuously worked to respond to the unique symptoms of Gulf War veterans. "Even before the 1991 Gulf War ceasefire, VA had concerns that returning veterans might have certain unique health problems, including respiratory effects from exposure to the intense oil fire smoke," said Lawrence Deyton, chief public health and environmental hazards officer for the Veterans Health Administration. "VA quickly established a clinical registry to screen for this possibility." But the data collected from the registry does not prove that Gulf War veterans suffer from any unique illness, Deyton said. "After 15 years, the principal finding from VA's systematic clinical registry examination of about 14 percent of 1991 Gulf War veterans is that they are suffering from a wide variety of common, recognized illnesses," he said. "However, no new or unique syndrome has been identified." The department did ask Congress for the authority to provide disability coverage, though, to veterans with difficult-to diagnose or undiagnosed illnesses who claimed the problem stemmed from military service. "This statute as amended authorizes VA to pay compensation for disabilities that cannot be diagnosed as a specific disease or injury, or for certain illnesses with unknown cause including chronic fatigue syndrome ... and irritable bowel syndrome," Deyton said. However, the government should take greater responsibility for conducting research on how to treat these veterans, said Brig. Gen. Thomas Mikolajcik, a Gulf War veteran diagnosed with amyotrophic lateral sclerosis, ALS or Lou Gehrig's disease, a rare condition that causes a progressive degeneration of the nerve cells in the brain and occurs twice as much in military personnel as among the rest of the population and two times as often among Gulf War veterans as other veterans. "Establish a congressionally directed ALS Task Force with specific milestones and a time line," Mikolajcik said.